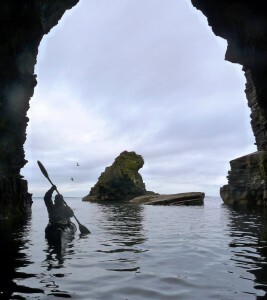 Sea kayaking off the North Northumberland or Scottish Borders coast are great adventures that require expert knowledge and good equipment. Active 4 Seasons can provide both. Our kayaks are specially designed for journeying on the sea, we do not have ‘Sit on Top’ kayaks designed for sheltered water! Some kayak experience is recommended for guided trips, alternatively coaching can be provided based on your needs. We have a wide range of Specialist sea kayaks so if you are looking to buy your first kayak why not come and try some out – just ask and we can advise. We run a monthly trip for people looking to improve their planning and trip running skills, these are guided trips rather than coaching sessions so if you are looking to improve your personal paddling then coaching would be more suitable. Many of our past clients now take out their friends and family etc. having developed their own skills with us. Winter and Spring trips are more suited to experienced paddlers. Summer and Autumn months offer the less experienced paddler the opportunity to come out. We do this by choosing smaller tides and selecting more sheltered routes based on those that sign up. The star system I have used indicates the predicted tidal flows at that time but obviously the weather, mostly the wind strength and direction determine the difficulty on the day! No membership required but if interested you can sign up to receive an invite to suitable trips based on your experience and aims. These trips will be off or along the fantastic North Northumberland or Scottish Borders coastline and are ideal for individuals/ couples looking to develop their skills in an informal atmosphere with the support of a highly experienced BCU level 4 qualified coach to guide and look after you. We are usually too busy in Jul and Aug to offer SKG trips but check out our Google calendar if you want to check availability? Please contact us if you are keen to join the gang or find out more about it. You can come out every month or once a year – no fee other than the day you come out. Price is similar for 2019, £38 per person with their own kayak etc. or £45 if you need to hire a suitable kayak. 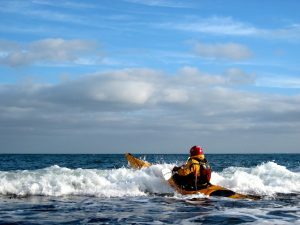 The fantastic North Northumberland and Scottish Borders coastline offer a variety of locations ideal for beginner and intermediate kayakers. More experienced paddlers might want a trip to the Farne Islands. This area will whet the appetite of any budding ornithologist with sea birds in their thousands. In the winter months we have over 4,000 grey seals, 2400 were born during this winter! St. Abbs head offers a real challenge too! If you are interested in getting into sea kayaking or developing your skills why not ask us to suggest some developmental coaching? We can run beginner and intermediate courses throughout the year. We also run bespoke courses for those wanting to work on a specific element of their skills – e.g. confidence in rough water, developing a safe rescue strategy etc. Just drop us a line to discuss your needs. Keep an eye on our Facebook page to see any upcoming events. “As part of a lovely camping trip my husband and I had the treat of a day’s sea kayaking with Ollie. Ollie clearly knows his stuff and the local area very well and easily set it up so that we would get the most of the day. The day was very helpfully split into two halves so that we could take turns with child care. Each session was well adapted to our respective abilities and interests. I am a complete novice but I had no problems in getting going and in spite of an overcast morning. I had a truly special morning with porpoises, puffins and sights of magnificent jelly fish. My husband had a longer session and more of a sporty adventure along the coastline. In fact this is the second time that my husband has been out with Ollie. First was a day out with mates and Ollie took them out for a superb kayaking adventure, miles along the coast to Dunstanburgh and some surf practice at Low Newton. What can we say, Ollie is the real deal! Thanks for a great trip yesterday, my first kayak outing to the Farnes was certainly a day to remember – excellent company both on and in the water!